All damage ratings are measured both in 'pixels', as a full shield or armor bar is exactly 56 pixels in height, and in the actual damage ratings measured in the game. Damage in the game is recorded by "Class". When scanning alien ships, one ship with "Class 5 Shields" may have quite a different level of protection as another ship. This is because alien ship armor is not measurable by sensors, and "Class 5 shielding" is an approximation. One ship may have slightly more or less shield strengths, but just happen to be close enough to still fall into the same catagory. Alien shielding absorbs exactly 200 damage per class. Alien shields do NOT regenerate. See the Ship Table below for more information on alien shield/armor strengths. Player shields regenerate 40 points per time unit. 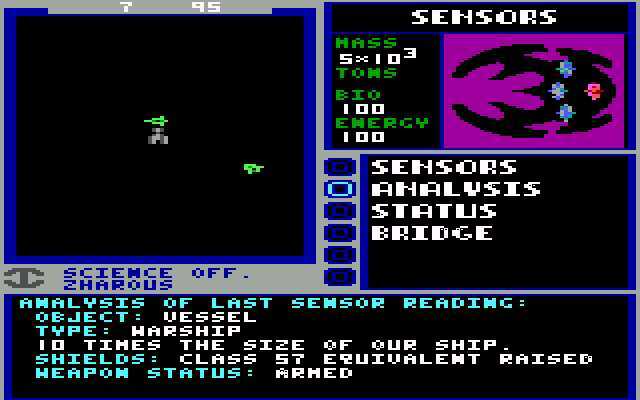 A time unit is impossible to measure because it varies depending on how many alien ships are visible on the screen, and your CPU speed. If you can get all enemy ships off your visible screen then it will appear that your shields are regenerating extremely fast. Shields only take 60% of the damage taken by armor. This is because with your base hull armor you actually reach armor class six. Your armor class rating on your initial encounter determines your damage reduction rating. Damaged armor is "rounded down" to the lowest damage armor class after encounters, and all subsequent encounters will experience the damage reduction rating of that class. For example, class 5 armor will take 8 damage from class missiles, and in that encounter will continue to take 8 damage until the armor is completely gone. If you leave that encounter and your armor is lowered from 56 to 44, then it gets "rounded down" to class 3 armor and will take 22 damage from missiles from each class 4 missile in the next encounter. When you dock at Starport, if your armor has been damaged, your actual armor remaining will get "rounded down" to the next lowest armor class. This does not happen in Starflight II. If your armor has fallen below the base 8 pixels, you MUST repair your ship to restore that base armor class before buying new armor, or else your new armor will also "fall down" one class. All damage is rounded to measurements of 2 pixels. Damage variation in missiles can be accounted for by fractions, as the averaging the first and second hit (if there is a variation on damage) often will be consistant and show you actual damage. For example, if the first missile always does 8 damage, and the second missile always does 10 damage, then the true damage will probably be closer to 9. Ship damage is based on the ratio of the value of all the ship's items to be repaired vs the percentage of ship systems still working well. Since communications and sensors cost 10,000 to dry dock repair, vs other systems (lasers, shields, missiles, engines) which have a drydock repair value of 1.25 X their purchase value, if any ship system is damaged below 20%, it's cheaper to scrap and replace it rather then repair it at starport. In addition, if your shields are damaged or destroyed, your damage will be rated as "moderate", but because communications and sensors are so "cheap", even if both are destroyed your damage will be only "slight". Enemy ships increase in defensive power as you attack them. This can be seen by scanning an enemy ship's shields. Since Gazurtoid shields are unconventional, you can not see how their shielding improves, even though it does according to this same scale. For example, Uhlek warship shields start out at Class 7, and as you kill additional groups of ships, their shielding jumps to Class 16, Class 25, Class 34, Class 43, etc. Small group increases simply improve their shielding by one class, but after enough kills of a certain class, their shield class jumps up by factors of 9 or 7, ignoring all smaller jumps. There does not seem to be any limit to this increase. If all Uhlek warships are destroyed in one game, their shields reach class 108. The saved game can be seen here. Whenever you are within 6 spaces or closer of your aimed target, your ship will automatically use lasers, if equipped. Beyond that range, missiles will be used. For this reason if you are fighting non-Gazurtoid for any reason, sell your lasers. Enemies can ONLY use lasers when you are 0-4 spaces away (straight line or vertically) So if you fight an enemy who does not have missiles, it's possible to shoot them effectively with lasers while at the same time being out of their range. Enemy ships, if equipped with both missiles and lasers, get to pick which ones they want to use at times. Plasma bolts travel exactly twice as fast as missiles and are homing, which made them almost impossible to dodge or avoid. You could pace them but not outrun them if you were already at top maneuvering speed (you can not get to top speed in combat mode, only manuever mode, and it's easier when you have good acceleration rating). The only effective tactic vs the Uhlek fleets is to first sell your lasers, then engage in short range combat by using missiles. Rotate your ship to all 8 points of the compass and fire off as many class 5 missiles as quickly as you possibly can without moving and hope you kill enough warships before the flood of plasma bolts annihilate you. The locations of the 11 Uhlek warship "super-fleets" are: 5,5 - 23,5 - 9,15 - 6,53 - 7,96 - 8,110 - 6,125 - 29,174 - 17,194 - 10,207 - 106,212. Class 5 Missiles, Armor, Shielding, and Engines all appear to be required to even have a wild hope of taking out a group. Now in combat, if you are using the shimmering ball (cloaking device), the plasma bolts randomly move to differerent areas and eventually hit you, but if you are not cloaked, they will stay in perfect formation around your ship until you move. When you get enough plasma bolts "in the air" the game will prevent any more missiles or plasma bolts of any type from being launched (your missile limit is different from the max # of enemy missiles), and the Uhlek warships will simply retreat until they are barely off the screen. Plasma bolts may "orbit" you from three different angles, right-left, top left-bottom right, and bottom left-top right. If you move at all when the plasma bolts are orbiting, a certain somewhat random number of bolts will hit you, with a lesser number of them hitting you if you move at a perpendicular angle. 2) Encounter the fleet, try to figure out which ships are shooting plasma bolts that hit you (target them) vs the Uhlek ships which are shooting bolts that are simply orbiting you. Keep as many missiles as possible in the air at all times, as it helps hit the "top missile # cap" from being reached sooner. Target any double or stacked ships if at all possible, because damage hits both ships equally. Plasma bolts tend to "eat" your missiles if both are on the same spot. If you want, you can try a missile + laser combination, which prevents your missiles from being eaten, but of course laser blasts will be much slower and weaker then a wave of missiles typically are. 3) If you don't die in the first few seconds (rare), and you reach a state of equalibrium (where the max # of plasma bolts are circling you), then the Uhlek ships will simply turn around and run off the screen. Hopefully by then you've killed 4-5 of them. Before their shields are increased to rediculous proportions, you have a good chance of killing all of them before this point. Retreating enemy ships are duck shoots, but only if they are retreating at "clean" angles (45°, 90°, 135°, 180°) etc, can you hit them with every single missile. 4) Wait. Let your shields recharge, wait some more. Any surviving Uhlek ships will remain slightly off your visual map. Occasionally the Uhlek ships will send distress calls for backup, and the reinforcements (usually 2 warships) will warp in at medium to long range. If your orbiting fleet of plasma bolts are still there, they will simply turn and run, giving you a chance to shoot a spread of missiles at them and hopefully kill one or two of them. 5) Exit and backup the game. Try to move ONE space and hopefully have 3 or less plasma bolts hit you, since your class 5 shields take 56 pixels damage before dropping, and plasma bolts do 18 damage each, you can absorb 3 plasma bolt hits (54 pixels). If more plasma bolts hit you, you'll typically die, or have ship systems completely destroyed. If you don't die, repair as necessary, wait till your shields recharge to full again, and then backup your game before moving 1 more space. Be aware that the Uhlek may call in reinforcements during this time, so remain in combat mode ready to launch more missiles. 6) Repeat step #5 until all plasma bolts are gone. Typically you can collect minerals from the ship debre at this time. 8) Any missiles or plasma bolts are "vaporized" when they hit the edge of the screen, so a little bit before the stream of missiles gets to the edge, run towards your target until the Uhlek ship is visible, and pray that they hit. If you score a kill, save the game and repair/wait till your shields restore. If you don't score a kill, restore your game and try again. Eventually you'll kill off any stragglers using this method. If too many Uhlek ships are off the screen in a tight group, it's nearly impossible to use steps #7 and #8 to kill them. If this happens, leave the encounter and re-encounter the ships again. Any ships you killed will stay dead, and you'll be able to attack the remaining ships at close range again, hopefully easier then the original battle was. If the battle is going "poorly" for an enemy race, they have the option to either send out a distress call for more ships (up to 6, unless around a homeworld, where it is unlimited), or to surrender. If surrendering, they will drop shields and disarm weapons and communicate with you normally. Of course if they meet you again with a decent fighting force, expect them to start their relations immediately with weapons first. After a few combat encounters, an alien race seems to somewhat "adapt" to your weapons. This applies to both your lasers and your missiles, not just one weapon type. Ships that formally died to only 2 laser hits will start requiring 9-10 laser hits to kill. 12 / 0.95 = 12.63 * .65 = 8.21 ~ 8 damage. Thanks to Jlhorner1974 for providing the hex code which included the ship fleet locations. Energy and Bio information is always shown as 100% on the scanner screen. Movement delays and firing delays are relative to the ship's activities. Larger the delay, slower the activity. If a ship is firing constantly in combat, it's movement will be even slower, as it can't move and fire at the same time. Certain ships are immobile, and will never move despite their movement delays. These versions introduced an engine class rating, and by modifying any of these values to 0 the alien ship will become immobile. Thanks to Jokedst for providing the ship fleet locations. The number of ships is not fixed. If a random group has a limit of 3-6 ships, you will meet between 1-3 ships in the first encounter. If they send a distress call for backup, up to 3 more ships to give you a total of 6 ships in total can arrive. Distress calls can be made anywhere, but are on a long delay. If you kill off all ships relatively quickly, they will not call for backup. The exception is around homeworlds, where distress calls are made immediately and full battlefleets arrive immediately, faster then you could possibly wipe them out. There are several types of "convoys": A lone scout, a 1-3 ship combination of transports & warships/scouts, a battle fleet of 8 warships, or a 1-3 group of scouts and warships. Ship positions in hyperspace are not fixed. Once you get close enough in range for them to "see" you, they will move towards your current position. In this way you can lead ships to all sorts of improbable locations. If you fight and kill off fleets in a star system, be aware that for each "motion detected" scan, you may find 4-5 stacked fleets traveling together, or in other words, you may have to kill one "group" off 4-5 timess. Ships in a system do not return or "rejuvinate", no matter what it looks like. If for example you wanted to clear out the Gazurtoid homesystem of the 8 groups of fighters, you may have to fight up to 32-40 waves of fighters to do so. If you fight and kill off fleets in hyperspace, there will only be one encounter per group of ships shown on this list. Once you kill them, they will be gone. The locations of the 11 Uhlek warship "super-fleets" are listed in bold below. For the insanely brave or insanely foolish, they can be found at: 5,5 - 23,5 - 9,15 - 6,53 - 7,96 - 8,110 - 6,125 - 29,174 - 17,194 - 10,207 - 106,212. Class 5 Missiles, Armor, Shielding, and Engines all appear to be required to even have a wild hope of taking out a group, and then it's more luck then anything else. See Uhlek Warship strategies in the combat section for more information. Make sure you sell your lasers before going Uhlek hunting.